I will be posting a short series on some of the interesting and relevant topics that came out of Book Expo 2012 in between book reviews. Indie books are a HUGE segment of the market now, and I have a resource or two to share with those who have chosen to take this route. I was taking notes during the sessions—especially the impressive and professional “Critical Reviews” session from the blogger convention—and I will share some of what I learned as well. To begin. 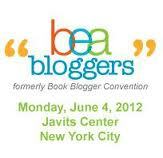 . . the blogger convention. 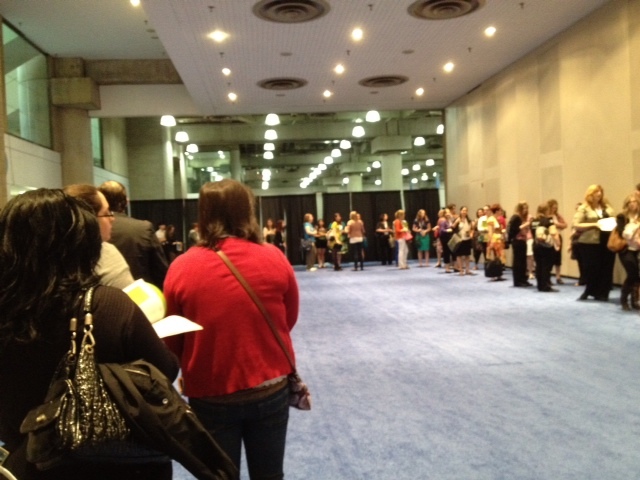 I was both ambivalent and excited as I entered the Javits Center on Monday. Am I too old for this, I wondered? Will it be terribly commercial? Helpful? Well, those, among others, turned out to have been valid concerns. I am going to speak honestly about my own views here, and they may be controversial to some. I realize that my point of view is in the minority at this point, and it is just one humble person’s opinion, so please bear with me. Gender: The conference was overwhelmingly composed of female attendees. Yes, there were some men, too, but if I had to give a percentage, I would guess five percent male, maximum. Not surprising, given that the two major speakers were both females and writers whose work would appeal to a female audience. Age Range: From where I sat (at the back of the room), it seemed to me that the majority of bloggers present were under 30. If I had to guess, I would say the largest group was the under-30 crowd, and the second largest group was composed of older attendees, over 50, perhaps. I, being “middle-aged,” certainly felt in the minority, but as I said, it was difficult to tell for sure. I’d be curious to hear other attendees’ observations. The “networking” meals: Hmm. This is where I could get myself into trouble. First, what were “networking” meals? A group of attendees at each table and an author sitting down and speaking with (or at) them for 15 minutes. The authors would then rotate; most tables had a rotation of four authors. I’m not going to name any of the authors, since I also learned the difference between constitutionally protected opinion and libel during the week. . . . Some authors were very engaging and wanted to talk with us. I got a lot out of those conversations–learned interesting facts about these authors and simply enjoyed human-to-human conversation. Some, however, just marketed their books to a captive audience. That was a disappointment and made me quite angry. Made me feel quite used, in fact. And where was the “networking”? This was a fan following for authors, a chance for them to “sell” to bloggers; it was not “networking” in any sense of the word. These authors saw hundreds of people over the week, so why would they have formed any special relationship at one (15 minute!!) event out of a large number of such events? As you can tell, I was not pleased with this aspect of the agenda. And it was during these “networking” meals when the full force of the corporate nature of this conference hit me. This is where I start getting controversial…the combination of the emphasis on “swag bags” and free merchandise, and the author-worshiping atmosphere was an axis around which this conference revolved. And I believe this is what many bloggers were concerned about beforehand. Now, I KNOW we all go because we like the freebies (we’re all human, of course), but to market (in the official conference video, for example) the conference that way . . . this is where my ambivalence came from. I was looking for a down-to-earth venue to meet other bloggers in my genre of choice. There really wasn’t much of an opportunity to do that. One way that aspect could have been improved would have been by setting up different tables for each genre or subgenre of literature, and letting us mingle. If an author had to be included, one or more from each genre would have been ideal. As it was set up, we were made to listen to book pitches for genres we didn’t even like! So, my overall assessment of the “networking” meals is quite negative. The panels: I found the morning “Blogging Today” panel (Zoe Triska, Erica Barmash, Patrick Brown, Jen Lancaster, and Candice Levy) to be helpful, especially in terms of the advice offered on how to get one’s content noticed. Bloggers have to be self-marketers to get noticed these days, given the plethora of blogs out there. An extreme (and from my vantage point, somewhat silly) example of this concept in action was the number of bloggers at the conference handing out business cards to every person who said hello (and some who didn’t). I don’t know about the other attendees, but I was there to make personal connections, not just to force business cards on people. Yes, one might receive a few extra one-time hits on one’s site as a result of this tactic, but consistent viewers? No. Bloggers will ensure a steady number of hits for other bloggers who share similar interests, rather than one-timers, in my opinion. So, I was reserved when it came to handing out business cards. Twitter is apparently the key to driving traffic to one’s blog. Not Facebook, for some obscure reason (which I have noticed as well). Stumbleupon was also mentioned. Goodreads is a helpful online reading community to be involved in for networking purposes as well. Regarding content, one suggestion to “spice it up” was to vary the content on one’s site, for example, setting up weekly features that focus on something other than books. Another idea was to write original content, as in something “meaty and interesting outside of your usual topic, in order to illustrate who you are [what makes you unique] . . .” Another piece of advice: don’t post every day if you are not inspired; if you are uninspired, so will your audience be. And one final thought was to promote imprints that the one really likes (making sure to explain your reasons why). It’s rather a different story for bloggers of self-published books, but even in this subset of publishing, one can find very small publishers and perhaps imprints one likes. As for this blog, my general focus is SP, but there are imprints of mainstream publishers that I would like to promote—those that have a penchant for signing on historical fiction authors and the smaller, more unique presses, the ones willing to take risks. The topics of code of conduct and plagiarism came up as well. I really have to question the mind-set of bloggers who don’t understand these concepts. They are so basic to almost any field of work: no rudeness, no hypercritical comments on a personal level, and no plagiarizing. I see plagiarism in my day job as a manuscript editor, and these are supposed to be college-educated authors, PhDs!!! Plagiarism is taught in high school writing classes, for crying out loud! Need I say more? Actually, yes. In our media-rich age, unauthorized use of images on one’s site can be a problem, and to avoid that issue, it was suggested to look for open-license photos on Flikr. Excellent suggestion, thank you! I’m going to save the “Critical Reviews” and “Demystifying the Blogger/Publisher Relationship” afternoon breakout sessions for a later post, since I have a lot to say about them and I’d like to get this post up before my train pulls in at the station. The main speakers: The two main speakers were Jennifer Weiner and Jenny Lawson. I was there for the first, but not the second. It was an entertaining talk, just not my kind of thing. Overall, this was a conference for bloggers to reiterate their self-importance. Yes, I found two of the sessions helpful (one made the entire conference worth the trip! ), but overall, I don’t think it offered much that will be of use to me because of its corporate nature. I’m just not sure about the blogging culture and how much importance it (including this blog!) should have in the business of professional publishing. Blogging is in its toddlerhood, I believe, and will most likely change and mature over time and with the fast pace of technological developments. I do wish there had been more substantive (intellectually speaking) breakout sessions, and I’m afraid the not uncommon lack of professionalism in conduct with authors and publishers, as well as in content, may slow what could potentially be a very thriving semi-intellectual* forum. But then, I’m coming from a very different place than many bloggers, I guess. Okay, I’m stepping down from my high horse now. *By using this term, I want to make it clear that I realize the purpose of blogging is not to write papers for a college course; I simply advocate a thoughtful, objective, and balanced approach to reviewing, as I have stated in my post titled “Advocating a Middle-of-the-Road Approach to Reviewing.” My reason for this position is that we, as bloggers, are interacting with the professional publishing community; therefore, we need to act professionally ourselves. Thanks for sharing – most interesting. I wonder, do we have this sort of thing in the UK does anyone know? Great post, Andrea… I was looking forward to the full report! The blogger con seems to have gotten less diverse and much more commercial than it was last year, and to be honest I don’t see the point of attending again. (In 2011 they had tables arranged by subgenre, and that was useful. Shame that’s one aspect they didn’t continue.) I heard there was a blogger unconference that happened this year that was focused on bloggers discussing common issues with one another, and that’s something I may be up for. I’ve been reading other takes on the blogger con, and you aren’t alone in your opinions. I liked your comment here very much. It’s a shame that something that gets started by enthusiasts turns commercial so quickly. Thank you for your comment, Kristin. It was a great disappointment and I’m glad to hear that others agree! And I have to tell you that I think the cover of your book, Selkie Dreams, is absolutely gorgeous! I haven’t read the novel yet, but I plan to at some point.